When I was 13 or 14 I came last in a cross-country race. I’d always hated running but had randomly done reasonably well in a school race so was picked for something like the district trials, where I came dead last. That was the last time I raced anything until I entered my first triathlon aged 26. I didn’t realise it at the time, but looking back, a deep-seated fear of failure was stopping me. I was too scared to do anything I might not be good at and too scared to try anything that might not be a success. Triathlon has changed this. As a triathlete, particularly a professional one, you face up to failure every time you put yourself on a start line. I’ve learnt that succeeding at a challenge that may not be possible is far more rewarding than doing something you know you can do. And that succeeding, when at first you’ve failed is even more rewarding. Signing up for my first Ironman. Setting my goal on Kona qualification, collapsing and ending up on a drip with 2 km to go in Ironman France 2008 and then giving it another go and succeeding at Ironman UK. Telling myself I was good enough to race pro. Telling my bosses I was good enough to work part-time. Racing Kona as a pro for the first time, walking 21 miles of the marathon and finishing dead last. 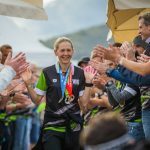 Racing Kona as a pro the second time and finishing 10th. Racing Kona as a pro the third time, 8 weeks after breaking my collarbone and finishing 9th. Trying to continue racing pro while back at work. Accepting that it might be impossible but it might just work. Racing 2 Ironman races 13 days apart. 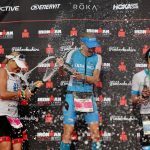 Racing an Ironman 4 days after my final medical exams. All of these seemed impossible at first. When I first started triathlon I hated the thought of trying something I might fail at. Yet with time, my mentality has changed. And right now, the bigger the challenge and the more impossible it seems, the more excited I get. If something seems easy I know it won’t be as satisfying. What I’ve realized recently is that I’ve taken this mentality forwards into other aspects of life. At the end of last year, I arranged a meeting with Gemma Hillier-Moses, probably once of the most inspirational people I’ve met in a long time. She was an elite runner who developed Burkitt’s lymphoma 6 years ago. Having survived treatment, she wanted to get back running, but there was no support to help her do this. So she set up MOVE charity (https://www.movecharity.org), aiming to support young people living with cancer through the power of exercise and sport. At the time I was working with lots of Teenage Young Adult (TYA) patients; this is what I want to do long term. It can be heart breaking but it’s also incredibly life affirming. It struck me that most of the young people were forced into inactivity during their treatment and struggled to get back into anything after their treatment. So I had been thinking about how we could encourage young people to work towards completing a Parkrun but needed a partner in crime. Anyway, Gemma and I met and realized straight away that we are both ‘can do’ people. Together we came up with two ideas. Firstly, a 12-week exercise programme for young people living with and beyond cancer, ideally integrated into the cancer care pathway. Secondly, an initiative to encourage patients and staff to attend a monthly Parkrun together. Looking back, we both laugh at our naivety for the former. “Let’s just do it”. How wrong were we. It turns out that incorporating anything into the NHS takes an enormous amount of paperwork, governance meetings, more paperwork and more meetings and the best part of a year. If you give up at the first hurdle you’ll never get anything through! But we’ve been lucky to get the right people on board and finally, last week Gemma ran the first ever MOVE cancer rehab exercise class at Nottingham city hospital. With the former, we decided to do it our way. Let’s just do it. Along with Stephen List, who was running the CARE programme (Cancer And Rehabilitation and Exercise, https://nottscountyfitc.org.uk/our-work/health/care/) we decided we would start promoting a monthly ‘Move Against Cancer, 5km Your Way’ at Forest Rec Parkrun in Nottingham. There were lots of reasons we thought we should try it. First, there is good evidence that exercise during and after cancer has tons of benefits. It’s associated with reduced fatigue, reduced side effects of treatment, improved physical and psychological wellbeing and potentially reduced risk of recurrence and improved survival. Second, most support groups are in the week, which isn’t much use for anyone who works. And third we knew from a survey of 432 ‘sporty people who have or have had cancer’ that I wrote with 3 others and shared through social media earlier in the year that there was demand for an initiative like this. In answer to the question ‘Would you be interested in attending selected Parkrun events if they were advertised towards people who have or have had cancer?’ 51% said yes, 29% said maybe and only 20% said no. So we just did it. We made some posters to put up in the hospital. We contacted Parkrun. And we set a date. What was the worst that could happen? It could just be the three of us on a Saturday but that’s hardly a disaster. We wouldn’t have lost anything by trying. But it turned out it wasn’t the three of us. We got lots of us. And the people who came told us how much they thought it would be helpful to have more. So we did another one. And then another one. And now the BBC has made this wonderful video clip highlighting why #5kmyourway works. Most of the guys at work I think rolled their eyes and chuckled when I told them about our idea and started putting the posters up. ‘Yeah yeah, this is just Lucy trying to get everyone running with her’. But slowly, they’re coming round. They’re realizing that Parkrun isn’t simply a running race. That in fact, it’s not even a running race. It’s so much more. “5km your way, Move against cancer” isn’t anything clever. It’s a walking/running club with a difference. It’s a coffee morning with a difference. It’s a support network with a difference. We’re simply jumping on the back of Parkrun, which is probably the most important public health initiative of recent times. But we believe we’re developing something that has the potential to offer huge physical, psychological and social benefits to those living with and beyond cancer. And so far, other than some banners I’ve bought for the hospital, it hasn’t cost a penny. Since the BBC clip came out, we’ve had messages from people all round the country wanting to do similar in their area. That alone proves it’s got potential and makes us believe that perhaps, ‘5km your way, Move Against Cancer’, might just become ‘a thing’. But the point of all this rambling is that, if I had never become a triathlete, I think my deep-seated fear of failure would have stopped me even giving it a chance to become ‘a thing’. I would have looked for a reason for it not to work, rather than finding a reason for it to work. When I went part-time at work I always told my bosses I thought triathlon would make me a better doctor in the long run. In truth, I thought these were empty words at the time, trying to convince them and myself that racing professionally wasn’t a waste of time. But if nothing else, triathlon has helped me overcome my fear of failure. And that alone, is a positive skill to take forwards in life.